Then is immediately relisted BIN OBO at $59,999.99. The seller has since pulled the listing and it appears as though he may enlist the services of a third party to sell it. We wish the seller all the best should he continue to pursue the sale. I'm sure it was an amazing feeling to pull and it'd be an excellent addition to any collection regardless of how well Ohtani performs in the future. With complementing border and uniform colors, it's a beautiful card. Each year brings us exciting hype surrounding a new prospect or two. We scout and find massive potential in young guys and as with any high risk investment, sometimes it pays off, sometimes it doesn't. Regardless, however, the hobby is better for this kind of thing as it keeps things interesting. Shohei Ohtani brings us a very intriguing mix of skills - he can pitch and hit making him the first dual talent professional baseball player since Babe Ruth. This is an extraordinarily rare combination of skills and the most impressive part isn't that he has both skills but that he's exceptionally proficient at both of them. 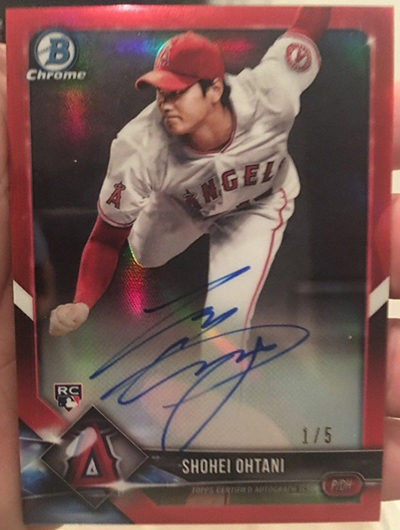 At the time of this writing, Shohei Ohtani 2018 Bowman Chrome cards are still fairly new and prices are extremely high. Some might agree it's a bad time to buy. As time passes and more Ohtani cards are produced throughout the year, prices are likely to correct. At this point, it's possible many of us wish we could turn time back to about a year ago when his 2017 Bowman cards were still at a reasonable reach. As they say, hindsight's 20/20. It's okay though, there will never be a time when Ohtani cards aren't available to some degree. They've already printed enough variety to go around many times over and it's only April. For the super elusive category of print runs of /5 or less, however, scarcity quickly becomes an issue. It's common to see a small multi-week window of availability immediately following a products release. After this critical window closes, much of this stuff gets locked away into permanent PCs never to be seen again. Timing is everything and if you can swing it and are interested, now's the time to buy these ultra low numbered cards. → For a checklist and image gallery of Shohei Ohtani's 2018 Bowman baseball cards, click here.